After a busy few weeks of traveling, I’ve been getting reacquainted with my kitchen, inviting Clara to wrap on her apron and join me at the counter. Our Montreal winter has been bitterly cold and the snow keeps piling up higher and higher around the house. I’m sure many of you on the East Coast can relate. There’s never been a better time to delve into comfort food, so we’ve been simmering pots of chili, baking bread and roasting vegetables by the tray-full. This cider ham was the first dinner I pulled together for my family this week. It’s from Brown Eggs and Jam Jars and, incidentally, this is the very first recipe I’m sharing on the blog from the cookbook. It’s one of my favourites, and simple enough to put together while jet-lagged, tired, and suffering from a head cold. Be sure to click through for the recipe, plus a giveaway for a KitchenAid 6-quart slow cooker. I developed this recipe with my traditional Sunday Dinner in mind, a make-ahead, no-fuss dish that could hold its own as the star of the meal. It does all that, and yields enough for leftovers, too. What more could you ask of a Sunday roast? Be sure to save the ham bone for Slow Cooker Split Pea Soup, another cold-weather favourite. 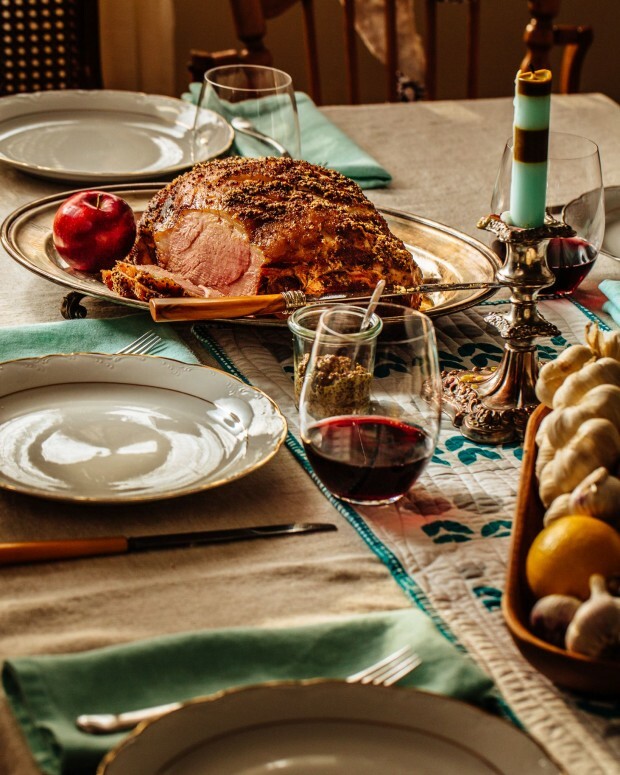 In the cookbook, this cinnamon-scented, mustard-crusted cider ham stars in an entire chapter on Sunday dinner, paired with Crispy Rosemary Roast Potatoes and Brussels Sprouts with Honey and Hazelnuts. Today, you get it as a preview of what lies between the covers of Brown Eggs and Jam Jars! If you’re a real planner….you may want to Pin or bookmark this ham for Easter. I know, I know, it’s still a ways off, but I’m already dreaming of spring, so making a holiday menu plan isn’t that unreasonable. Somehow, staying in from the cold has its appeal, now that we can linger around the table with family and friends. 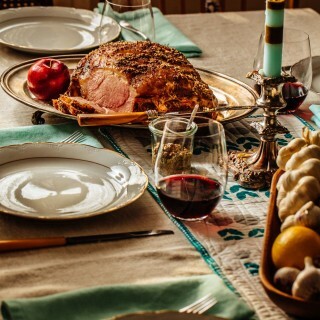 This cinnamon-scented, mustard-crusted cider ham is the star of Sunday dinner. Rub marinade all over the ham, using every bit of it, and place the ham in the slow cooker. You may have to trim the ham to make it fit. Just add the trimmings to the slow cooker as well. Peel the orange and coarsely chop the pulp, discarding any seeds. Add the orange around the sides of the ham and tuck the cinnamon stick in also. This ham will keep in an airtight container in the refrigerator for up to 3 days. So many of my go-to recipes are made in a slow cooker, both here on the blog, and in my cookbook, so it seems only fair to offer one for your kitchen, too. 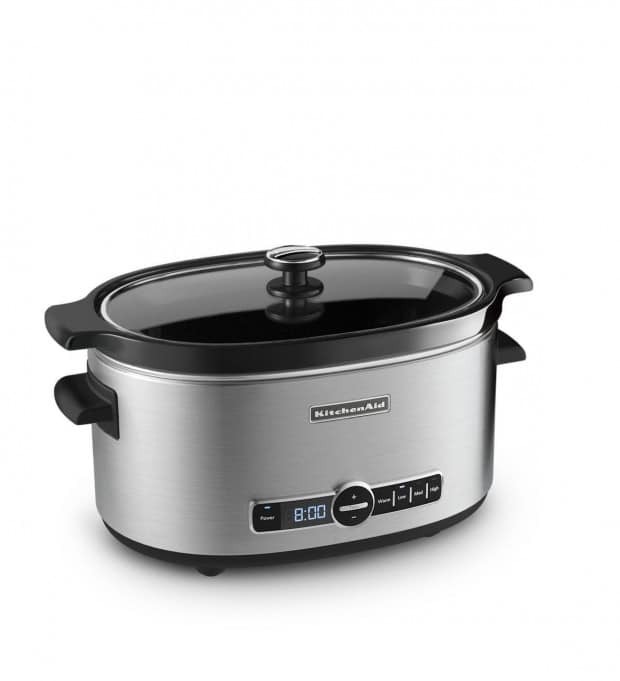 Thanks to KitchenAid Canada, I have one KitchenAid 6-Quart Slow Cooker with Solid Glass Lid to give away to a Canadian resident (sorry, international folks, this one is nation-wide only). To enter: leave a comment and tell me what you would make first in this brand new slow cooker! That’s it! Good luck to all. Giveaway ends, Sunday, March 1, 2015 at 8AM. Winner will be announced both here and on Facebook. THIS IS A THING OF BEAUTY – both crockpot *and* ham! My crockpot pooped out on me two weeks ago and I miss it so. The ham been tagged in my cookbook to make. I was going to try it out using a Dutch oven, but I’m afraid it won’t yield the same result. It would be a comfort food fav this time of year. Beef Paprikash!!!!!!!!!!! There is nothing like putting together dinner in the morning and having it come out perfectly at the end of the day! Especially during these last few dragging weeks of winter. My go to is definitely Quinoa chili with fresh cornbread, mmmm! Our baby girl arrived two weeks ago and slow cooker oatmeal is proving to be a lifesaver in the morning scramble to get something warm and nutritious into everyone in the morning! Beef pot roast sounds good on this snowy day here in the Midwest! I would make a vegetarian chili in this brand new slow cooker! Oh my!!! I think this recipe might have to be the first thing I make in the crock pot. Looks amazerbeams. I’d make baked beans. I’ve always wanted to try making a batch of my own so I can play with the ingredients but have felt far to guilty leaving the oven on for the hours it would take to cook them in a conventional oven. It’s been on my mind since I read it in your book, and I was thinking to attempt it without a slow cooker. I would make pulled pork for tacos! I would love to try a pulled chicken recipe with homemade barbecue sauce or something I’ve never made before is your Cider Ham. I’ve never even cooked a ham before and this sounds delicious. This might be a boring answer…but bone broth. A staple in this house. Pulled pork for the hubs! Well obviously I’d make this recipe first! Perfect for Easter! My mom used to make a crock pit donnrr of sliced strip steak in a tomatoey saucea nd served over rice. I would call her up for the recipe, no doubt! Thanks for the great giveaway! I think the first thing I would make is my Creole chicken recipe which is one of my faves. Although that ham is making my mouth water. I would make split pea soup – with the ham bone from tonight’s dinner! Thanks for the inspiration. I would use it to make freezer recipes for when my baby is born in April! We would likely make chicken or vegetable stock. I would make this ham recipe! I would make a beef stew. I’ve never owned a slow cooker and think it might be a useful addition to my kitchen. I would make a jambalaya! I’d also love to try your cider ham recipe! I’ve always wanted to do lasagna in the slow cooker! So much to choose from! My old slow-cooker died on me a while ago. My first recipe would probably be homemade chicken stock. Simmered for hours. I would make my Hawaiian BBQ chicken!! Vietnamese Slow Roasted Chicken is my go-to crockpot meal. But I would love to be able to fit in a bigger chicken! Why, I would make your slow cooker ham obviously! I desperately need a slow cooker. I bought your cookbook yesterday and found myself up very early this morning, unable to wait! My first recipe in a slow cooker would be my Oncle Louis’ Haricots Cuit au Four. He passed away last year, and the recipe was passed on to his family members. My Tante Jacqui recently had surgery for lung cancer, and I think it would warm her heart to have a bowl of her brother’s baked beans. The only glitch? No slow cooker and the recipe is full of delicious ingredients…but no amounts! Wow…I think I would try this recipe for the first time in the cooker….thanks for the giveaway! I love slow cookers. I think the are the best tool for putting dinner on the table on busy days. With this slow cooker I think the first thing I’d make is a split pea soup, so perfect in the slow cooker! I am a big soup lover (especially when it is so cold outside!) … first I would make my favourite soup … chicken noodle soup! Pork shoulder with white wine and tons of garlic is my favorite winter meal from the slow-cooker, but I also love simmering any bones, chicken, lamb or beef for the best bone broth for soups! Love how much it gels when it simmers for hours or even days for the beef bones. First creation I would do is Lamb Obsession, followed by redskin fudge, followed by apple scrolls, then marinade pork belly, pulled pork… I am so in love with my slow cooker and it died tonight.